We used to be big paper towel users. I mean, huge. I was buying a ton of paper towels, but still couldn't keep them stocked in the kitchen. "What's going on?" Were we also eating them? Were the kids building forts with them? Where are they all going? Turns out I was the biggest offender. They're so convenient for cleaning up spills, using as napkins, and drying things off and then tossing them away, that I was using them all the time. We were big recyclers and savers, so this didn't make any sense. I had just gotten used to the convenience. It was time for a change. In honor of Earth Day coming up this Friday (4/22), I want to tell you the 6 biggest (yet simplest) ways that I cut our paper towel use down to virtually nothing. It isn't any more difficult or less convenient, and it cut down on our carbon footprint. Hopefully, this will give you some ideas on how you can cut down on your own paper towel use too! #1. Buy Select-a-size paper towels. If you haven't seen these in stores, look for them. They are a genius innovation where instead of pulling off a full-sized sheet at the perforation, they are also perforated in the center, so you can tear off a half sheet instead. Each brand will usually have their paper towels in regular sized sheets and a select-a-size sheets, and since they're been out for a long while, even store brands have them now. By changing your purchase to select-a-size, you can immediately cut your use down by half. #2. Use cloth napkins instead. You can stock up on cloth napkins for meals at home, for the kid's lunchboxes, and for camping and picnics. You can get cheapie napkins for everyday in fun colors and patterns, and pretty napkins for occasions. Look for cheap cloth napkins at dollar stores and discount retailers. Thrift shops will usually have a large selection if you don't mind not having complete sets. If you have kids, I would opt for napkins in dark colors and patterns. Not all of those stains will come out! If you're thinking, Not more laundry!, it really doesn't add much considering they're very small pieces of fabric. If you can sew, you can even make your own for virtually nothing. Napkins are simply a piece of fabric with finished edges, and if you own a serger, you can turn these out in no time. #3. Use dish sponges for spills. If you've got kids (or husbands, lol), you probably deal with a lot of spills. Instead of reaching for paper towels, reach for a dish sponge. No, not the one you use for dishes; Your cleaning sponge. You can find large packages of plain dish sponges for cheap and designate them for cleaning. You will eventually throw them away, but you can use them over and over for quite a while, just clean and dry them after using. To keep from cross-contaminating your dishes, take a fat sharpie marker and make a large "X" or other mark on both sides. That way you can keep it up by the sink to dry and you won't accidentally wash your silverware with it. #4. Use a dishrag for cleaning counters. Instead of spraying your counter with cleaner and pulling off a wad of paper towels to wipe, reach for a handy dishrag. I buy large, cheap packages of these periodically and have a little corner in a drawer where I keep them folded. If you wipe your counters down a couple of times a day, think of how many paper towels you could save in a month! #5. Use Tea Towels or dishcloths for drying duty. I wash my hands a million-ty times a day, and instead of drying hands on a paper towel, I have a dishcloth or a tea towel (depending on where in the world you are) hanging over the stove handle. If I need to handwash kitchen items, ditto, I'll use a dishtowel. Easy! #6. Use old clothes and towels for household cleaning rags. I learned this trick from a professional cleaning woman. If you have old t-shirts or towels that are ripped or holey, instead of tossing them in the trash, rip or cut them up into rag-sized pieces, then run them through the washer and dryer to remove errant threads and fabric fibers. Keep these in a designated cloth bag (you can even carry it with you while cleaning), dump the clean ones out, and as you use them, throw the dirty ones back into the bag. You can clean up some of the grossest jobs, throw them in the bag, then dump the whole bag in the washer! Just make sure you shake out any solid particles over the trash can first. 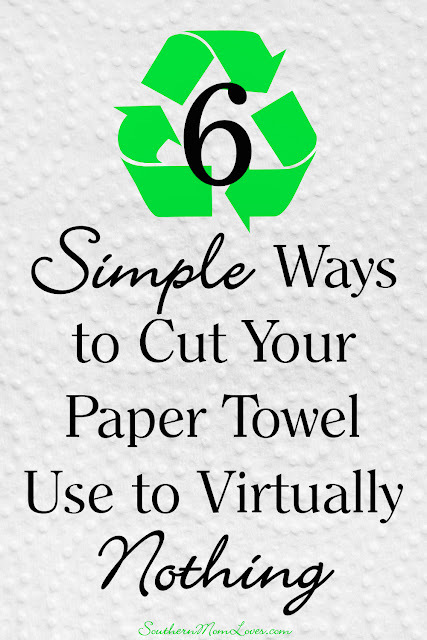 I hope these tips help you cut down on your paper towel use too. You don't have to go for all of them at once, but even just doing one or two can help so much. Thanks for reading! 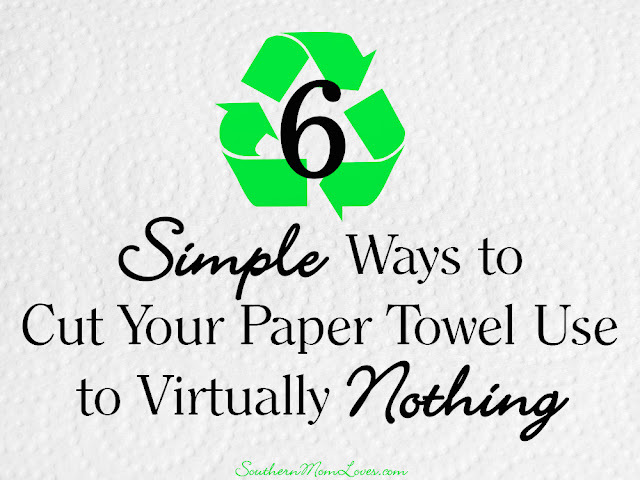 Are you an avid paper towel user? Will you be using any of these tips to cut down? What are your favorite ways to be more eco-friendly. I love to read your comments!